I was tagged by Eds. :) Thanks sis! I also got the same tag from Pat which I opted to post on my other blog. 4. Don’t forget to link back. In your case, link back to http://www.tsinay.com. Most of our 'firsts' made some sort of impact on us ... they have become the fabric of our lives ... so, dig back and remember. I got these questions from n@w, one of my mailing lists and I just could not resist :). Anybody may snag these questions if they want to. Happy Father's Day to all the Dad's out there! 1. How long were you together before you got hitched? 2. What made you fall in love with hubby from the start? I love talking with him! We share a lot of ideas. And although we may not agree on some things, we can discuss about it and not end up at each other's throat! And he makes me laugh. It doesn't hurt that I like the way he looks too! 3. What's the best gift you ever received from him? But the BEST gift I received from him is actually his love. The small gestures that made me realize that hey, this guy really loves me. No grand gestures for him, just small everyday gestures that show how he loves me and now, our son. 4. What is hubby's best traits? Worst traits? Best traits: When he's doing something, he is very focused on the job. He's very loving, very understanding, and in his own way, he is very sweet. Oh, and he's very handy around the house too! Worst traits: When he's very focused on something, he tends to forget about other stuff. This sometimes drives me crazy. 5. Is he the spoiler or the disciplinarian? Both, I guess. Materially though, he tends to spend more for my son's toys. 7. What traits/mannerism/character did your child/children inherent from hubby? Late to bed, late to rise. They're both night persons. 8. Let's say you and your child/children are talking about daddy, what do you want to tell your kids about their dad that they don't know? 9. What is one thing Daddy cannot live without (materially)? 10. If hubby can read this, what's your message for him? Dear, it's been a wonderful three and a half years of marital bliss. My life has changed for the better since you came along. I am truly looking forward to growing old with you. I've been tagged by Lissa! :) Thanks sis! I posted this on my new blog. 2. Place your blog's name with your URL at the end of the tag. If you have more that one blog, please add them too! Just make sure that you post this tag in all of your blogs. 5. 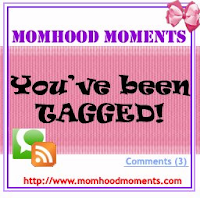 Return to the Momhood Moments blog and leave a comment saying that you joined the tag together with the URL of the tag. Tagging: Leah, Mari, Happy, Issa, Eds. Different Parenting Styles for Different Generations? Being both Chinese and Filipino, I am bombarded on both sides on advices on parenting. It just gets to be plain confusing at times! I'm sure it was even more confusing during my mother's time, when she had no option but to listen. Nowadays, we have more information sources, including the internet, so we can make researches about what's right and what's not. Teach kids the love and respect for one another, for the elders and for other people in general. I think this transcends cultures and generations. But I guess Asians are stricter when it comes to this. I find it shocking for people to show disrespect, especially for elders. Remember, we are all going to grow old someday. Taught the value of money. All the money we got from Chinese New Year (ang paos) were in my mother's safekeeping. She then helped us open bank accounts. She didn't want us to spend all that money. That all worked out for the best. Send kids to a good school which puts a premium on values formation. The school should be a partner of parents not only in teaching academics, but also in instilling the right values. It helps a lot if the values of the parents and the school are in sync, because both complement each other. That's what happened to us, hence I believe that we have a strong moral backbone. And I want that for my kid/s. Let my kids learn Chinese. And Filipino and English, of course. More languages is always an advantage, but it's especially good to know the language of your forebears. If my kid/s want to learn more languages, GREAT! Let kids study on their own with minimal supervision. My mom never really had to tutor us. We had the initiative to study on our own. And we got decent grades. I really could not understand why almost all students need tutors nowadays. I really hope I get to achieve this and not eat my words later. My mom is a working mom but I never felt neglected during my growing up years. I would like to achieve the same thing. I breastfed. For 1 year and 10 1/2 months. I will continue to do so for any future kids I might have. I was a bottle fed baby, as were my siblings. I do not blame my mother, though, because that was the orientation during the seventies, that bottlefeeding is somehow better. Even dolls come with feeding bottles. It really seemed natural at the time. But I've since learned that breast is best. I co-sleep. We slept in cribs when we were younger. Nothing wrong in that. I thought I would do that too and bought a crib. But since my son got sick and we both found comfort in co-sleeping, it stuck! I did not force toilet training at an early age. This one I am at two minds about. When you do readings, you will find that some people advocate early toilet learning. Others would want to wait for signs of readiness. I really do not know if I'm doing the right thing. As of now, it feels as if my son will be in diapers forever, but of course I know that's not the case. Allow my kids to voice their own views and opinions. My parents are the products of a more authoritarian parent age. Although they were already more open minded than their own parents, there are times when they do the parent card and want us to do things just because they said so or they want it that way. Frankly, for a small child, that is still okay, even good. But not for a mother in her late thirties! I sometimes feel that I am quite overruled in my decisions. But I know they only have my best interests at heart. For my kids, however, I'd prefer that they voice out their own views, opinions and concerns, and I'll listen. I may not agree, but I will listen and we can discuss the matter. Teach my son/s to cook, launder, sew and other women's jobs. Let my husband teach my daughter/s to do repairs, change a flat tire and other men's jobs. In my parent's time, and even up to now, some jobs are classified as men's jobs and some as women's jobs. So, my mother never taught my brothers to cook and even discourage them to hold a needle and thread, since in the Chinese culture, it is considered unseemly for men to sew. I do think that times are changing and everybody should know a little bit of everything, so that we do not have to be too reliant on other people. Also, some men are very good in what are considered traditional women's jobs, while some women are very good in what are considered men's jobs. Teach my kids to invest at an early age. Well, investing is always difficult. But starting to invest at an earlier age would mean a lot more time to be more aggressive, and a lot of time to recover from mistakes. I want to teach my kid/s more about financial literacy. Of course, investing was trickier during my parent's time. Now there are many options for investing, and with the advent of the internet, it is much simpler. This is all I can think of for now. I'm sure there are lots more. My conclusion is that there are a lot of good in what our parents taught us and I am eternally grateful. But times are a-changing and we need to be able to adjust to the times. During our parents' childhood, not everybody has a TV. Now we have TVs, playstations, etc. It's different raising a kid then and now but we have to rise to the challenge as parents. This is my entry to the 3rd edition of the Pinoy Parenting Blog Carnival, which I am hosting at my other blog, The Working Mom. Chinese are very big on Zodiac signs -- the Chinese Zodiac, that is. This is also true of overseas Chinese like Tsinoys and Tsinays. We use as a basis for choosing auspicious dates for weddings. Do you know your Chinese Zodiac sign? You might want to check out your sign. I promised myself that my children are going to know how to speak and write Chinese, aside from English and Filipino. I feel sad whenever I know of friends who can no longer speak Chinese. It's part of our heritage. Although strictly speaking, we're now citizens of the Philippines and should speak Filipino, we should never forget where we came from. Besides, another language is always an advantage. The Chinese Filipino is a subculture...never fully Pinoy, never fully Chinese. We have our own unique set of traditions modified from those set by our forefathers. We embrace both cultures and try to INTEGRATE.